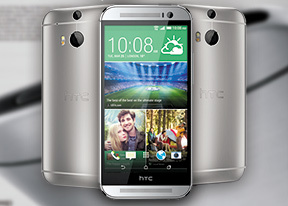 The HTC One (M8) packs just about every connectivity available for-end smartphone today. You get quad-band GSM, quad-band 3G and market-dependent LTE support, making the One a true globetrotter. The local wireless connectivity has Wi-Fi a/b/g/n/ac and DLNA support (both client and server, for images, videos and music) and stereo Bluetooth 4.0 with the high-quality aptX codec. HTC has conveniently designed a special options screen, when you connect the One with a PC. The long list of options includes Portable Wi-Fi hotspot, settings, USB and Bluetooth tethering (the phone becomes a modem). There's microSD card slot too with support for card with up to 128GB of storage. In addition to it, the device also comes with 50GB of free Google Drive storage for two years. HTC's Portable Hotspot is on board too. It supports WEP, WPA or WPA2 encryption. The app can be set to power off automatically after a defined period of inactivity, saving your battery in case you forget to switch it off when you are done. The HTC One also has a built-in Infrared port, which, coupled with the excellent remote app, allows you to remotely control a whole host of living room equipment. The smartphone can be setup to control all sorts of TVs, receivers, various video and audio players - pretty much any gadget that uses the standard Infrared remote controls. The HTC One comes with an MHL port, so if you plug a MHL dongle in, you can output HD video over a standard HDMI connection. The phone's UI is mirrored on the TV and with the 1080p resolution of the display, watching video on an HDTV is a joyful experience. Google Chrome interface hasn't changed since its launch for Android and is clean and minimalist. At the top there's an URL bar with a refresh/stop buttons next to tabs and settings buttons. You can switch between tabs with a wide swipe from either the left or right of the top bar. Opening the tabs area reveals a list of tabs which can be closed again with a left or right swipe. The animation accompanying this action is neat, too. Of course, one of Chrome's strengths is its ability to seamlessly sync with its desktop version, using nothing but your Google account. This allows you to open an article on your PC and finish reading it on your mobile phone. It also syncs your bookmarks and favorite sites and can remember passwords and login data.